They’re agile, cute and furry, and we’re nuts about them! Red squirrels are one of the most loved animals in the UK. With their distinctive russet fur, tufted ears and twitching tail, a red squirrel is always a captivating sight in the forests of the UK. Yet these flashes of red are becoming scarcer, with the current population is estimated to be only 160,000. 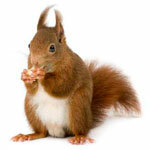 Support these adorable little creatures with Red Squirrel Week. There are events at selected red squirrel sites across the UK. See http://www.wildlifetrusts.org/?section=events:autumn:redsquirrelweek for details. To celebrate Red Squirrel Week we have 10 copies of Britain’s Favourite Animals to give away. Click for a chance to win. If you’ve had a long day out in the cold squirrel spotting you will need a quick and warming dinner Good Food, Fast: Dairy Cookbook has the answer: Try the truly comforting Quick Cottage Pie.